Caroline Bradlee Designs > HOLIDAYS > MARDI GRAS! 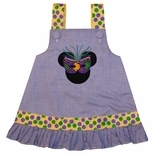 Celebrate Mardi Gras with Custom Made Mardi Gras Clothing for Children Including Personalized Outfits and Dresses. We specialize in customized Mardi Gras clothes for little ones so that they feel grown up like mommy and daddy going to the parties and balls! Forget the floats and costumed men and ladies, your little girl and boy will be the center of attention at all the parades.